There are not very many underclassmen prep basketball players that can perform against the best teams at the highest level. Center Yellowjackets sophomore boys basketball standout Keyren "KJ" Spiller is one of the few players excelling at a high level while being one of the youngest players on the varsity squad. KANSAS CITY, Mo. — There are not very many underclassmen prep basketball players that can perform against the best teams at the highest level. Center Yellowjackets sophomore boys basketball standout Keyren "KJ" Spiller is one of the few players excelling at a high level while being one of the youngest players on the varsity squad. "Man, it feels good. It took a lot of hard work," KJ said. "It was really helpful for me and my team because, I wouldn't have been here without them, without my parents and my coach. They push me hard every day. And, we [are] pushing each other in practice. So, it just made it easier in the game." When Center boys basketball head coach Ledale Wooten was asked about who Keyren was off the court, his eyes lit up like a proud father talking about his son. He spoke about KJ's incredible maturity on and off the court and his interaction with others around him. "He has phenomenal character. I mean, just a very happy kid. He comes from a great home with two great parents. KJ serves a role as like a protector. I mean, he's really loyal. He loves his family. [It's] first over everything. And, one thing I love about KJ is, that's his motivation. That's why he plays the game as hard as he does," Wooten said. "He plays the same role for this team. We all know that KJ is the youngest player on our team. He's a sophomore , you know. But, with him, he's like everybody's big brother. You know, he's really like everybody's little brother. But, he's everybody's big brother. So, you know, it's the same aspect here. He's our protector. The look to him. He's our big guy. He's a leader," Wooten finished. As for Keyren's physical gifts and abilities on the court, they were on full display this past week. Keyren definitely played some of his best basketball in the 39th annual William Jewell Holiday Classic Basketball Tournament from Dec. 26-29. He helped the Yellowjackets (6-4) advance to the championship game against Rockhurst (11-0). Center eventually lost to the Hawklets 76-53. 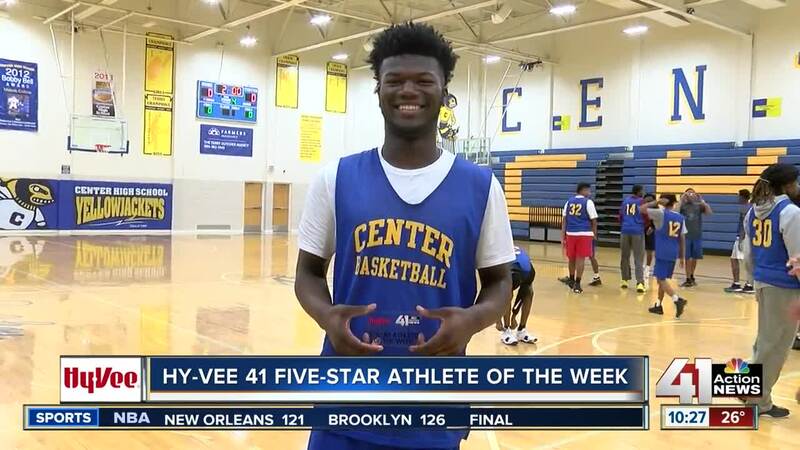 However, KJ's performance was certainly worthy of earning this week's Hy-Vee 41 Five-Star Athlete of the Week honors. He led the Yellowjackets with 18 points in a 64-63 overtime win over Park Hill, scored 29 points in the Center's 66-61 win over Liberty North in the semifinals and was named to the all-tournament team. "I picked my spots. My team, they told me and they [saw] I was getting hot and [getting] going. They told me to go. And, they helped set me up. For real, it wouldn't be able to happen without them," KJ said. Keyren's teammates also say they believe in him and how he can help the team. "KJ, he's very goofy, very friendly off the court. [He's] a very talkative guy. He just brings the energy to our team that we need basically on and off the court," senior point guard Darius Walsh said. "He's just a great guy all around." As for the remainder of Center's basketball season, Center says they studied the blueprint that other city schools, in the area, like Hogan Prep and Grandview took in winning last year's state championships in Missouri Class 3 & 4 respectively. Center feels this year could be special for them. But, they note that it takes an immense amount of hard work to reach that level. KJ is optimistic that he and the team are putting in the work necessary to make a strong tournament run this year. "When we [get] in the game, we all combined together and we played together. So, when we got in the game, it made it easier," KJ said. "That's all we do in practice is run, work on defense. And, we do a lot of scrimmaging, getting up and down, learning how to play with each other, picking each others spots. That helps so much when it comes to game time."